"The all-new 2019 Ram 1500 is the strongest, most technological and most capable light-duty truck we have ever built. But we didn't stop there," said Reid Bigland, President and CEO, FCA Canada. "We sold over 100,000 Ram products in Canada last year and we pride ourselves on knowing our customers and listening to their needs. That's why the all-new 2019 Ram 1500 Sport is being built exclusively for the Canadian market and why we are confident our truck owners will embrace the unique style and capability it offers." The 2019 Ram 1500 Sport rides on standard black 20-inch aluminum wheels, with optional 22-inch ‘Black Noise' alloys (available for the first time on 4x4 models). The all-new, dampened aluminum tailgate with integrated spoiler features black badging, plus the new, chiseled all-black Ram's head logo and a ‘Sport' badge - reserved exclusively for the Canadian marketplace. An integrated dual exhaust completes the pickup truck's "Canada-only" look. A new generation of TorqueFlite eight-speed automatic transmission is standard and includes more than 40 individual shift maps to optimize fuel economy, performance and drivability. 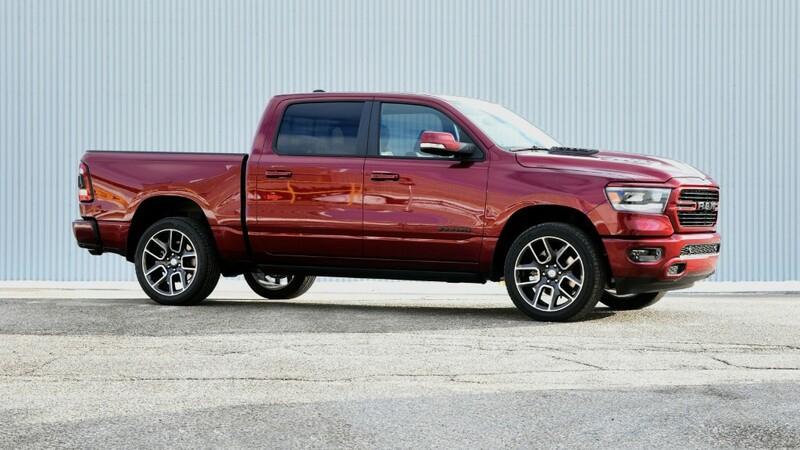 The 2019 Ram 1500 Sport is offered as a 4x2 or 4x4 with an on-demand transfer case with four operating ranges: Auto, 2HI, 4HI, and 4LO. The Auto range optimizes the distribution of torque based on vehicle driving conditions, without driver intervention. Offered as either a Quad or Crew Cab, the Sport model wears a unique all-new Ram 1500 interior. The all-black cabin with black headliner features an exclusive combination of trim touches, including satin light black chrome highlights, real metal trim and a diamond plate-look on the centre stack borrowed from Ram Rebel. The instrument panel and cluster brow are soft-wrapped and features Diesel grey French accent stitching. The closed upper glove box wears a unique ‘Sport' badge. Unique-to-Canada are power heated sport cloth/premium vinyl seats with a special ‘hex' insert mesh fabric. Optional leather heated and ventilated seats also feature a unique technical embossed texture reserved only for Canada. The 2019 Ram 1500 Sport comes standard with power adjustable pedals, CD player, heated steering wheel, and much more. Every Sport comes standard with Ram 1500's new reconfigurable console with space for a 15-inch laptop or hanging files, sliding front cupholders, fixed rear cupholders and large storage bins. A dual-pane sunroof is available on Crew Cab models, which also offer a reclining rear seat and a flat rear floor, plus 12.7 cm (5 inch) larger in-floor Ram bins that can accommodate a 4-inch drop hitch.